The morning sunshine at Loch Ken wakes me up on Friday the 18th of August and reminds me to pack up my tent and everything that belongs to it. My breakfast is quick and sufficient and I’m off to the next ferry from Scotland to Northern Ireland. I buy the ticket for the short crossing directly on the spot. If you are alone or in pairs you can be so spontaneous, with larger groups I would probably book a few days in advance, for space reasons. So I didn’t have to give up the freedom and spontaneity on my solo trip, working out perfectly until now. Arriving in Belfast, it is clear to me that the tyres would only last for a few more kilometres at best, but unfortunately there’s hardly anyone along the Irish coast who could change the motorcycle tyres professionally, nor has the right type of tyre in stock. The next possibility to change is in Dublin in nine days, but the tyre will never last as long. So I am in need for a new set of tyres. After the local BMW dealer is unable to help me at such short notice, I head for a highly recommended tyre dealer in the north of the capital. After one hour and at favourable conditions everything is done. Luckily, I’m able to find a reasonably priced accommodation in a centrally located hostel despite the advanced time. 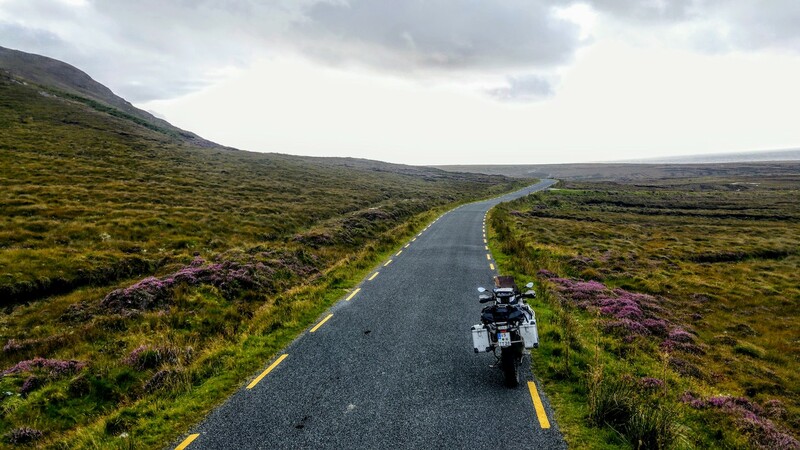 The next morning I leave the pound’s country (Northern Ireland), and finally, at the border to the Republic of Ireland near Londonderry, coming to the starting point or the signpost to my destination – the Wild Atlantic Way (WAW). The WAW route will continue to meander along the Irish coast for the next few days, constantly impressing me with rugged rock formations, the overwhelming vastness of the land, inviting sandy beaches, refreshing lakes and green-covered hills and mountains. 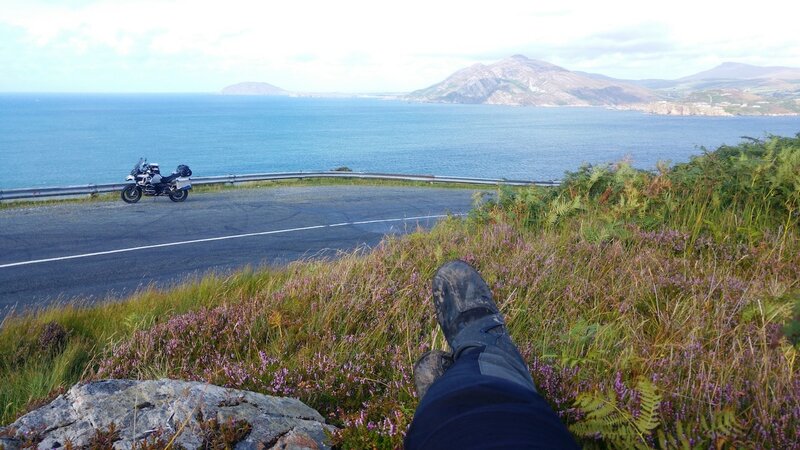 The following places lay on the 480 kilometres (300 miles) of coastline on my day’s ride: Greencastle, Ballyliffin, Letterkenny, Portsalon, Creeslough, Derrybeg and Dungloe, until I am again pitching up a camp in the evening on a site in the middle of the beach dunes in the Rossbeg region, a surfer’s paradise. The next day Mother Nature shows me what she has to offer. By means of fantastic and actually unknown expanses to a German guy, which leave me stunned with amazement. I notice how the helmet becomes tighter and tighter because of the content grin on my face. 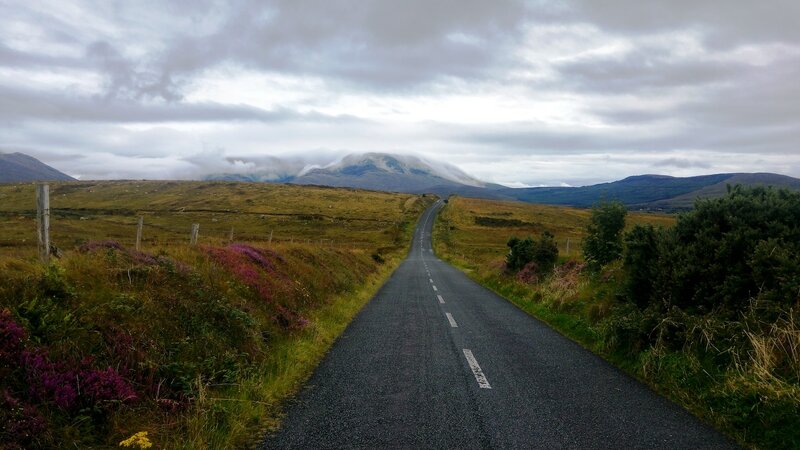 Actually, you can stop every five minutes to enjoy this view, but my curvy 460-km tour always leads me along the coast until I arrive in Lisdoonvarna via Galway in cold humid fog.